One wouldn't expect it to breathe fire, until it does. Cardiling, the Firebird tuxemon, is a Fire-type monster. Spalding004 has released his Sitran Fakedex under a Creative Commons Attribution 4.0 International licence for us. 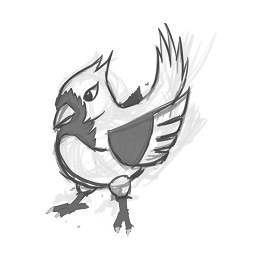 Independently, Kyu came up with a Fire-type cardinal monster, so we combined the two. Original designs by Spalding004 and Kyu. Sprites by Spalding004. Back sprite by Sanglorian.